He wears some expensive pants, an extravagant belt, along with matching shoes and a shirt. He carries two Warhammers of Wounds. [verification needed — Does he lose them for fighting if you buy them from him?] 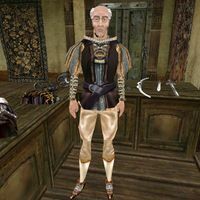 Aside from his natural bonus and resistance to magicka, and his ability to shield himself for short periods, he knows the following spells: Reflect, Sotha's Mirror, Weak Spelldrinker, Vivec's Feast, and Spell Absorption. This page was last modified on 23 November 2018, at 06:24.